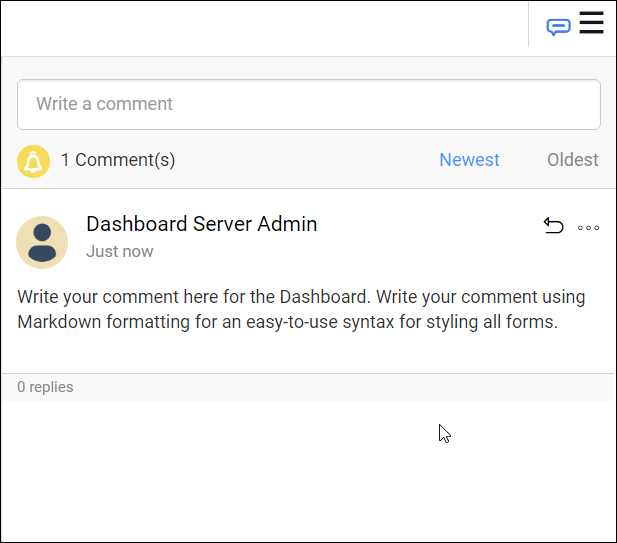 This section explains on how to collaborate with other users in the Syncfusion Dashboard Cloud by commenting on Dashboards. 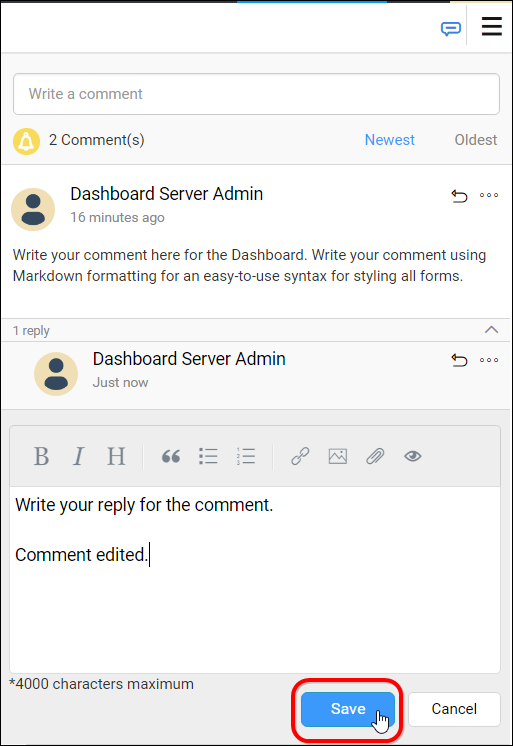 Collaboration feature in Dashboard Cloud lets the users write comments on a Dashboard to share with other users who has access to the Dashboard. They are useful for tracking events and providing insights into those events. Users can also add links to other Dashboards or any other external websites. 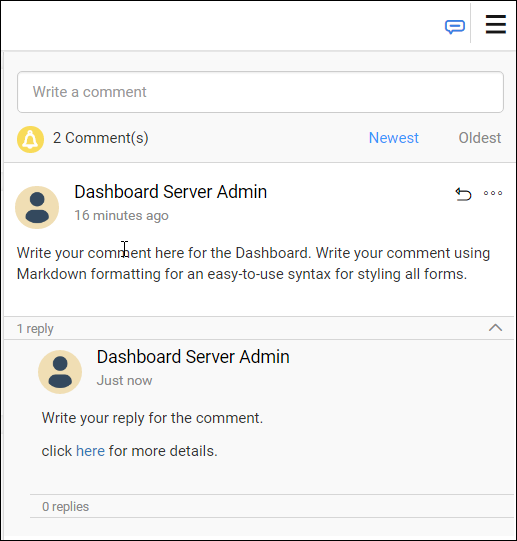 Anyone with access to a Dashboard can write comments. 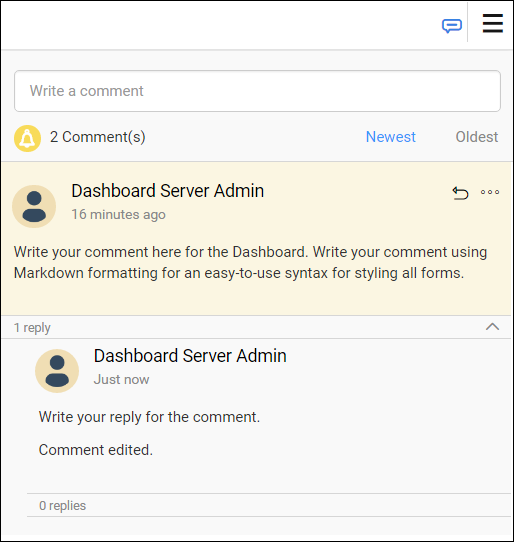 When a comment has been added to a Dashboard, users who have notifications enabled in their profile, receives notifications through email and system notifications. Learn more about Notifications in this section. To post a new comment, open the Dashboard and click on the comment icon in the top right corner as shown in the below image. 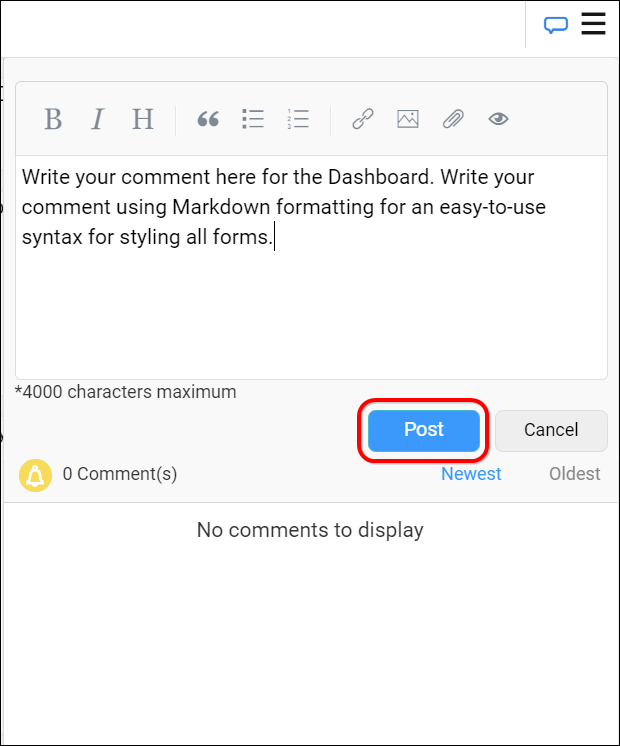 Type the comment in the text area and click on Post to save the comment for the Dashboard. Clipboard images can also be added along with the comments by simply copying an image and pasting in the text area. To reply to a comment, click on the Reply icon in the comment as shown in the below image. Type the reply in the text area and click on Reply to save the reply for the comment on the Dashboard. You can also reply to a reply of a comment. This can be repeated a number of times. 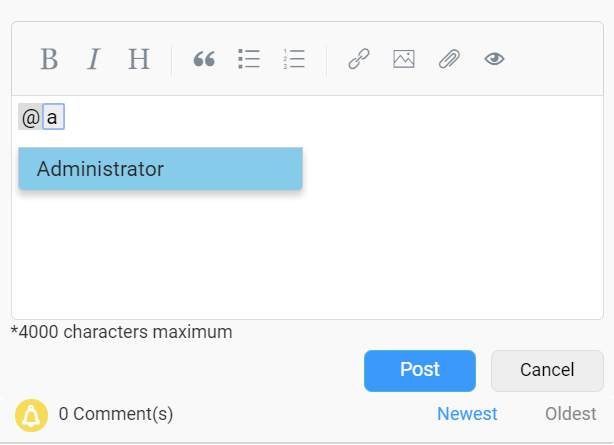 To edit a comment, click on the option Actions button to get more options for a comment or a reply and click on the Edit button as shown in the below image. Edit the comment and click on Save to save it. 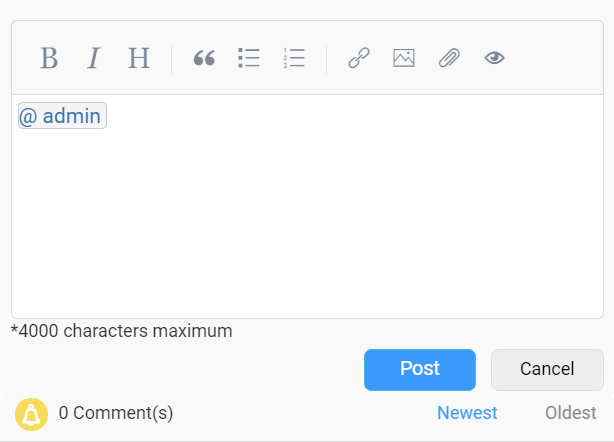 To delete a comment, click on the option Actions button to get more options for a comment or a reply and click on the Delete button as shown in the below image. To know the parent comment of a reply or to know which comment the reply has been posted, click on the option Actions button and click on the Show Parent button as shown in the below image. On clicking, the parent comment is highlighted for the reply as like below. Users can be mentioned in the comments to notify them about the comment through email. Type @ followed by the user’s name and from the list of possible names select the user to mention them in the comment. 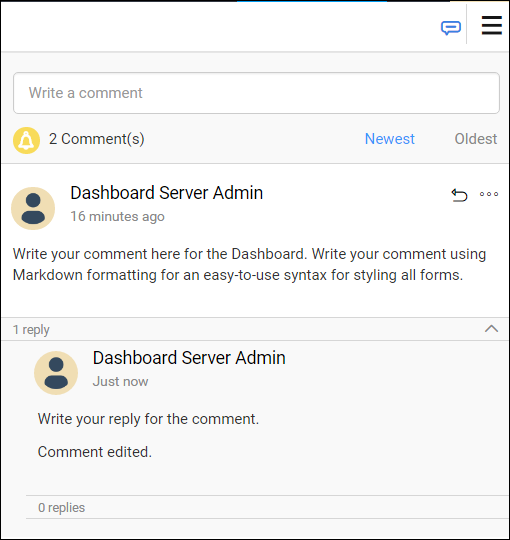 The above options - Post a new comment, reply to a comment, edit a comment, delete a comment and show parent comment of a reply applies to Widgets inside a Dashboard.click here for more details about Dashboard and Widget commenting.